The third at Boulder Pointe’s Dunes course is a 450 yard par 4. Teacher’s Comments: Overrated. Slow. Wouldn’t go back. 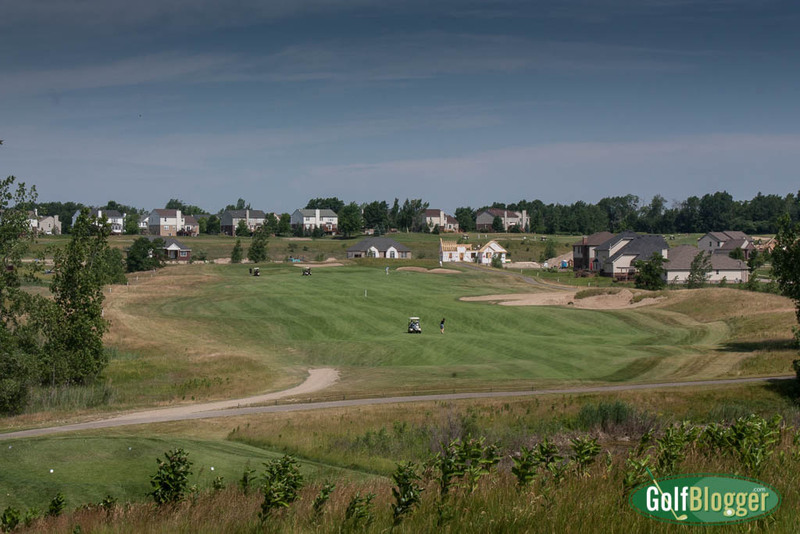 This review of Boulder Pointe is for the Dunes and Bluffs nines. The Peaks nine was inexplicably closed on the day I played. 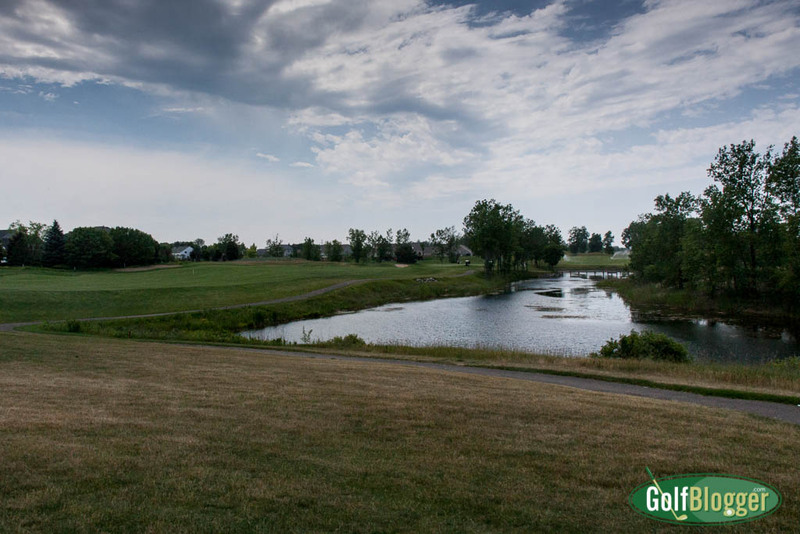 Boulder Pointe is a course that routinely gets mentioned among the top courses in the Metro Detroit area. I have no idea why. It is, at best, a rather pedestrian development course. Perhaps the Peaks elevates it to a different level. 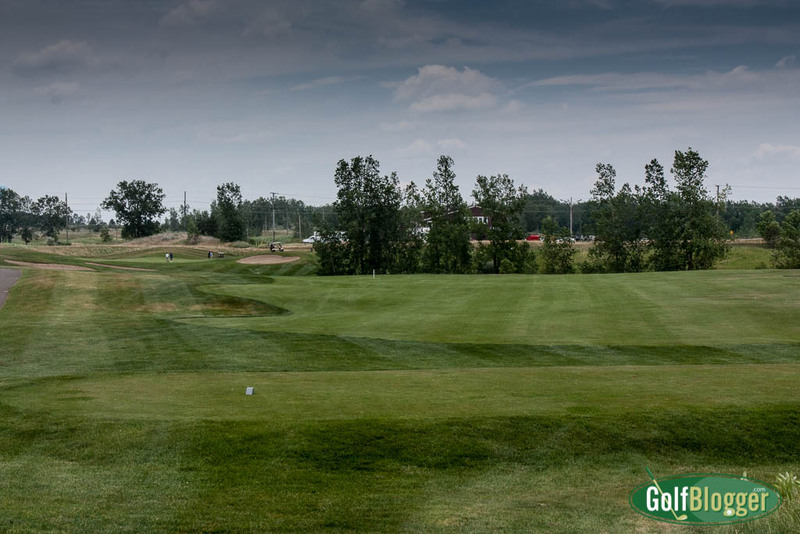 The Dunes nine is relatively flat, and pretty much a series of straight shots: Hit the ball straight as far as you can, the hit the ball again at the green. In the meantime, enjoy the scenic houses, some of which are under construction. The exceptions to this uninteresting theme are the par four sixth and seventh holes. After a solid tee shot, the sixth presents a steeply downhill shot to the green. On the seventh, players must gauge their tee shots well to avoid running out of fairway into a strip of marsh in front of the green. The Dunes measures 3, 593 from the back tees and plays to a 37.5/138. The first at Boulder Pointe’s Bluffs is a 391 yard par 4. The Bluffs is a little more interesting. There’s a nice elevation problem to consider on the first, with an approach shot over a ravine to a green set against a hill. After the tee shot on seven, the fairway plunges severely downhill into a ravine and then back up again twenty feet to the green. Several of the holes have turns you need to consider off the tee. My two favorite holes on the eighteen were both part of the Bluffs nine. My overall favorite was the par five sixth. This 545 yard hole starts uphill from the tee box, turning gracefully around a hillside to the left. It finishes on a green well guarded by bunkers to the front and right, and a steep drop-off on the other side. The ninth at Boulder Pointe’s Bluffs course is a 423 yard par 4. The other one I liked was the ninth on the Bluffs. This true dogleg measures 423 yards, bending around a long pond that hugs the right side. The back tees require players to bite off a significant chunk of the pond to land their balls on a narrow fairway. The more forward tees turn this hole into a very friendly and short straight shot at the green. The Bluffs side also has virtually no homes, although it looks as though the developers were planning on them. The Bluffs is separated from the other eighteen by a highway. After playing the first, the cart path takes you through a narrow tunnel deep under the adjacent highway. Holes two through eight are on the other side. Players then need to go back through the same tunnel to get to the ninth. The Bluffs from the back tees measure 3, 343 and play to a 36.1/128. Conditions on the day I played were mostly good, in terms of fairways and greens, but just off the fairway, the course was often spare and dusty. Not what I thought I’d find at a “premium” course. Pace of play was not good. My group waited for one — and sometimes two — groups on every tee, and those groups were waiting on the people in front of them. If this is how the course is midweek, I shudder to think of the horrorshow it must be on the weekends and holidays. This Boulder Pointe Golf Course Review was first published July 13, 2016. Boulder Pointe's Dunes Hole 2 is a 186 yard par 3. The third at Boulder Pointe's Dunes course is a 450 yard par 4. The fourth at Boulder Pointe's Dunes is a 412 yard par 4. The fifth at Boulder Pointe's Dunes course is a 452 par 4. The sixth on Boulder Pointe's Dunes course is a 451 yard par 4. The approach shot on Boulder Pointe's sixth hole. The seventh at Boulder Pointe is a 416 yard par 4. The eighth at Boulder PointeDunes is a 182 yard par 3. The ninth at Boulder Pointe Dunes is a 538 yard par 5. The first at Boulder Pointe's Bluffs is a 391 yard par 4. The second at Boulder Pointe's Bluffs course is a 165 yard par 3. The fourth at Boulder Pointe's Bluffs course is a 318 yard par 4. The fifth at Boulder Pointe's Bluffs course is a 508 yard par 5. The sixth on the Bluffs course at Boulder Pointe is a 502 yard par 5. The seventh on the Bluffs course at Boulder Pointe is a 439 yard par 4. The ninth at Boulder Pointe's Bluffs course is a 423 yard par 4.